When I started Fell running, or running off road before that, I had no ambition to race (despite that being the impetus to get me started – I got entered into a race in 2008 – the GRIM). But as the runs got longer, faster and more challenging and my fitness grew and being a smidge competitive the racing idea really bit. Now lets be frank – I am a mid to back pack runner. A top 50% finish for me is a good day and racing typically for me is as much an extension to the ‘adventure’ an off road run offers me – but typically in a different place over unfamiliar ground . That all said I have grown to really enjoy the buzz and the sense of camaraderie at Fell races. a Fell race start line is second only to a doctors waiting room for horrific medical stories. “Hello mate – how are you?”, “oh blimey, you wouldn’t believe the ache I have in my left leg..” OR “well I’ve got this cold and I’ve not run for over two weeks”, “rough mate, I just want to get round and finish today you know..?” and so on. Make no mistake, the minute “go!” is shouted these people, if you so much as blink, will have left you in their wake for dead. 2018 SBPR start line, just before my brief. One such race that I really enjoyed was the Stan Bradshaw Pendle Round. A classic race on Pendle Hill, just short of ten miles and about 590m of climb its reputation is that of a very runnable race – the record is an hour and six minutes. The bulk of the climb is all at the beginning, the rest is level or trending downhill, bar too short sharp climbs near the end. It is a race organised by my running club – Clayton Le Moors Harriers. Check points to run too, no marked course to follow, local knowledge and or navigation skills required. In Fell runners speak it looks like this: BM, 16.7km/590m ER/LK/NS over 18. The extra challenge is that it is an early spring race – the first Saturday in March so the weather can play its role too. I ran it three times in all and continue to enjoy the running the route to this day, which is just as well really! After the 2015 the Race Organiser (RO) wanted to step down and was keen to off load the race ASAP. I had long thought that organising races might be a way to make some income – you know £25 race entry for a medal and t-shirt type races. Fell Running is about as far from that as one could imagine, but might be a good place to learn the skills required to operate commercial races. The SBPR was essentially a fundraiser for the Clayton Junior section (subsidised vests and race entries for the kids etc.) but also made a donation to the local Mountain Rescue Team (Rossendale and Pendle MRT). the conversation ran between various committee members and running training nights, but no one wanted to pick it up. I wanted to run it, so stayed quiet.. (RO’s cant run in their own races… ish) Then I thought, well perhaps I should be the one to RO, I like the race, I know the hill and the route well, i felt I would be a suitable ‘custodian’ of such a well established race. Although the SBPR came in to being in 2011 before this it was named the Half Tour Of Pendle and goes back over 40 years. I tentatively put my hand up…. A big part of Fell Runners Association (FRA) races is the Race HQ, frequently rural, a local school or marquee at a summer fete for example, the SBPR runs out of Barley Village Hall where the committee there put on soup and cakes and drinks for the runners post race – always a long queue for Audrey’s soup! A formal expectation is that RO’s liaise with local land owners to get permission for the race to be run. This is where the fun started… Most of the land owners are very supportive and understand that 200 odd runners are not going to have a long term impact on some of the less well used tracks and trods on the hill and so are happy to give consent, this includes United Utilities – the local water company who have been nothing but supportive as I learn this trade. One individual farmer however has a tricky set up, his sheep lamb in early March and the home fields he uses to keep the ewe’s close are the same fields we want to finish our race in. The big concern is rainfall – too much and the ground (boggy at the best of times) gets cut up making it difficult to get his quad bikes up the hill to collect any struggling ewe’s and bring them back to the yard. Now I get that – this land is his income essentially, where as it is my recreation. Of course I will support him in that and do not want to make a tough job harder but I do believe the impact of the runners – on a public right of way anyway – is over stated. Either way, I have been asked to re route the finish. Not a major problem and actually the re route has been praised as a better finish by many. After that first discussion – and refusal I decided in the medium term I wanted to change the route. That said in 2017 – were were on the usual finish, 2018 changed again! I am now determined to change the route to avoid his land full stop. Best get the map out! So what are the stresses and worries? Well, entry forms in advance. It should be an easy matter – I know, I fill them in to, but peoples hand writing is at least as bad as mine! ( I type and print mine out). Also – email addresses, I ask for an email so I can acknowledge I have received the runners entry – a simple courtesy to my mind but also to pass information regarding route changes, or even a possible cancellation, if runners don’t supply an email address – it is a pain – potentially for them! I must confess the idea of an online entry system is appealing…. Flagging the amended course in sub zero gale force winds the night before. The weather. We had snow in 2016 and 2018. Barley village is in a valley with several steep hill roads around that regularly get cut off in snow. The weather is the main consideration really, although the concern is less for the runners well being – they will have decent kit (we check) and tend to like the adventure… it is the marshals, who are stood largely still for several hours and have to get in to position and off the hill again. I marshal myself in both a paid professional basis and as a club volunteer – I know how baltic it can be stood still for a few hours – even on a summers evening! So the initial risk assessment I did, in line with the FRA’s RO guidelines gave consideration to weather impacting on the race. In short, if we can get to the start line there will be a race – it just may be a shortened one, as this year 2018. Marshals. Getting the right people in the right place at the right time. It takes approximately 25 people to steward the race to the standard I want. This is in part due to various Checkpoints (CP’s) requiring a count of the runners – not just heads, but the actual number on their vest so we know not just how many but WHO is on the hill and ultimatley safe back again. Believe me the various sweepers who have supported the race all tell tales of runners “heading off in the wrong direction” or generally looking confused with a map in their hands. The count is a vital mechanism. 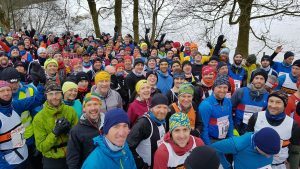 Following a fatality during a race – that could have possibly been prevented -no one new the runner was missing, the start line count has become a part of the fell running tradition. We know that as so few people grumble about it now! Especially on the longer races or when the weather is poor. For accounts of the tragic side of fell running – it does have its very real risks – do read Steve Chilton’s “its a hill – get over it” A great book on Fell running, which mentions several Clayton legends and races including the SBPR amongst its place in the wider athletic world. 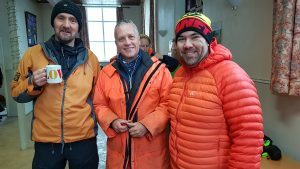 As a club Clayton are keen to encourage more people in to the sport (fell running) as are the FRA, so with this in mind, as as a tool to help me keep abreast of the race course conditions as much as anything else, in 2017 I offered to host two reconnoiters of the course (recce’s) for people who perhaps had never done the race, but weren’t sure if that distance on the fell was for them. I offered it at a slow pace, (c2.5 hours) with time spent looking at the map to explore route options and also allow people the time to gain some familiarity with the course. In 2017 over the two dates I had just under 30 people join me from the club and in 2018 over two dates we had 14. Most of which came and did the actual race – so time well spent! Next year I am going to run one for the club and one for the wider fell running community – I shall advertise it to local clubs I expect. I do intend to develop a new route also…. before the bracken gets too tall! Here is a copy of the race report from the 2018 which should be in the Spring 2018 Fellrunner magazine. I eventually got my boots on the hill around 19.30. Goodness it was windy! But actually aside from the odd drift, the ground conditions were pretty good. The wind was forecast to be dropping, so the “shortened race” option was the obvious one. Thank you to my wife for getting a “he is on his way” message out on Facebook! I eventually got to speak to the Marshal team and all of them were very prepared to don their big coats and make the race happen. Phew! The race delivered some testing conditions which will live long in the memory of the 156 runners who set off. A strong field with some great route choice saw a tight battle between some Pendle regulars and an Airedale Orienteer– Alasdair McLeod, eventually stealing a march on Holmesy and Clayton local Holdsworth to take top honours. Thank you to everyone who thanked me on the day and in the days after, but as ever the biggest thanks go to the marshals who we hope to have thawed by March 2nd 2019. 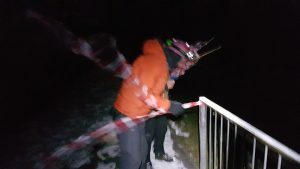 The race nets about £500 for the club and Mountain Rescue. I do enjoy the process and like very much seeing racing from a different perspective. It enables me to “put something back in” to a sport I have come to love and feel passionately about. I fully intend to continue organising the race for the foreseeable future. For those wondering who Stan Bradshaw was, and why he has a race named after him, you will have to come to Barley Village Hall, on the first Saturday in March with your fell shoes on and read the history of the great man on a display I put up inside the hall to occupy the awaiting runners. See you on the fell.